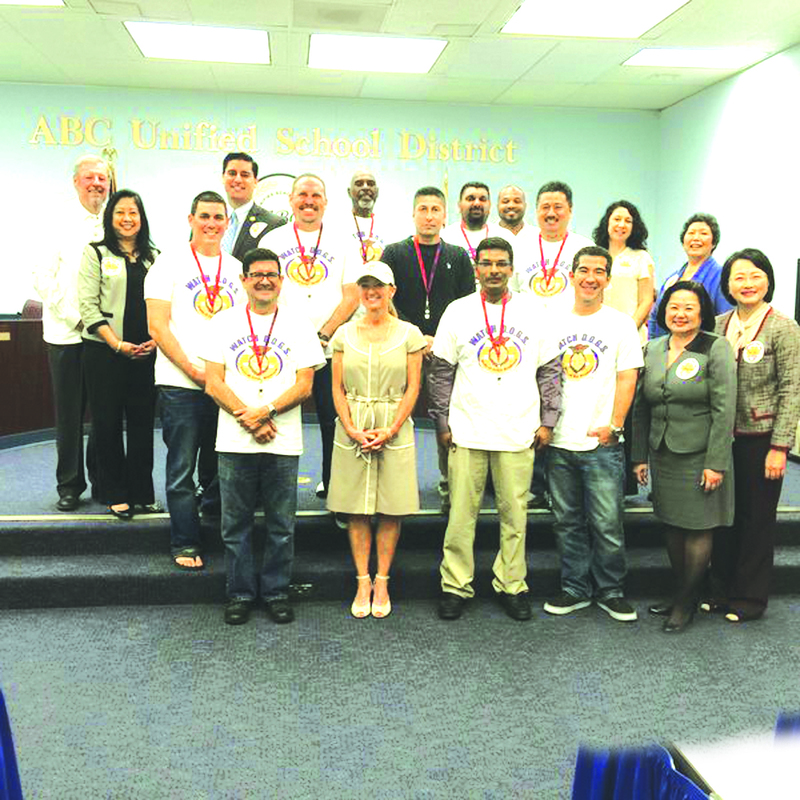 Nixon Elementary WatchDOGS receive recognition from the ABC USD School Board. The program is a “father involved” initiative from the National Center for Fathering that helps to organize dads and father figures to provide positive male role models for students. Photo by Tammye McDuff. Nixon Elementary School has implemented the Dads of Great Students otherwise known as the WatchDOGS program, aimed at engaging fathers, inspiring children, reducing bullying and enhancing the educational environment at Nixon. The program is a “father involved” initiative from the National Center for Fathering that helps to organize dads and father figures to provide positive male role models for students as well as augmenting school security. Superintendent Dr. Mary Sieu introduced WatchDogs as part of the Spotlight On Teaching and Learning Accountability Program within the District. Nixon Elementary Principal, Melinda Ortiz, father of a first grader and Lakewood Sheriff’s Deputy Jeremy Draper, and Ryan Romero made a moving presentation called ‘Heroes in the Hallways’. The program, involving grades K-12, invites fathers, grandfathers, uncles, or other father figures to volunteer at least one day all day at their child’s/student’s school during the school year. Volunteers sign up through a launch event such as a Dads and Kids Pizza Night or Donuts with Dad, or by calling their child’s school any time throughout the school year. The program is overseen by a “Top Dog” volunteer who partners with the school administrator to coordinate scheduling and identify opportunities for WatchDOGS to provide assistance at the school. WatchDOG dads and volunteers perform a variety of tasks during their day including monitoring the school entrance, assisting with unloading and loading of buses and cars, monitoring the lunch room, or helping in the classroom with a teacher’s guidance by working with small groups of students on homework, flashcards, or spelling. They actively engaged with not only their own students, but other students as well. Nixon Principal Ortiz relayed one of the most heartfelt instances, “On the day that LAUSD received an email threat, and I really had no idea what to tell parents and students so that they felt safe. It was very early and I had not contacted any staff. As I drove up to the school and into the parking lot, there were four of our WatchDOG Dads, ready to assist and protect us, anyway that they could.” Ortiz said she heaved a sigh of relief knowing that they were ready to serve the school. Romero said one of his favorite experiences was when a kindergartener drew him as the subject of her art class, ‘because he made her feel safe’. WatchDOG Dad Doug Lovgren commented that it was a great program, “We come to be a dad on campus, tie shoes, or have lunch with the kids. This is your opportunity to really be the big man on campus. As a program of the National Center for Fathering, more than 5,148 registered schools in 47 states participate in the WATCH D.O.G.S. program. The program is also popular in China, Canada, Mexico, Puerto Rico and Barbados.